Best v-brakes / brake pads for year round riding? Discussion in 'The Shop' started by swoody, Jun 9, 2012. I want to replace the pads with the best all-weather pads I can find, but am also interested in hearing any suggestions people may have for upgrading the brakes, cables, or levers as well. If I do replace the brakes, I will still need clearance for knobby tires and a set of full coverage fenders. I have heard great things about sealed brake cables. Has anyone used these? Is there any special tools, maintenance, or care these cables require? If anyone can suggest manufacturers and / or models to look into I would really appreciate it. Open to any advice at this point. Thanks everyone! Let's not fvck around here, Avid Ultimate levers and arms, linear cable. If you want to really upgrade linears, you go to bearing pivots. Use one-piece housing and nosed ends and it will stay clean. A Jagwire Ripcord kit will give you enough housing and the nosed ends. Cane Creek DC5 for me. DC3s if you want to save a some dough. My 5s have GOBS of stopping power. I run Cool Stop Black replacement cartridge pads. Never found the need to go to their Red pads. Some will say the Direct Curves are finicky to set up. I just say to not worry if you need to use different tension on one side vs the other and they're very easy. Also, the long arm, short arm design (that is switchable from left to right sides, BTW...which I believe the Avid Ultimates can do as well) can often allow more direct cable routing due to not having to route the cable through a noodle. Housing directly into the brake arm. Great if you want to run full housing in sloppy conditions. Gobs of clearance for tires. Also, per the noodle-less design.... I've had frames where my heel or shorts may have come into contact with the brake arm noodle on Avid style V brakes at times due to how it sticks out. Not an issue with the CC DC5. I can't comment on different levers. I run Paul's Love Levers. The non-compact, longer ones. LOVE them! I have never run any fancy sealed cable system. (Gore, Avid, etc.) I have only run the black Teflon coated Jagwire inner cables with regular ole' housing and have never had any issues. Clean, smooth, pull. You guys know the 4300 is a $500-550 hardtail? Most basic setup to get you running again is new cables, housing, v-brake noodles, and brake pads. Shimano, avid, jagwire make good cables, 2X $3 + housing $2foot X 5ft= $16ish. Noodles are $3 each x2. Koolstop brake pads $15 X2. I would suggest Deore brakes. $22, light, stiff, good tolerances, comes with good replaceable pads and noodles. Does your bike have integrated shifter/brake lever combo? If so, don't worry about levers. 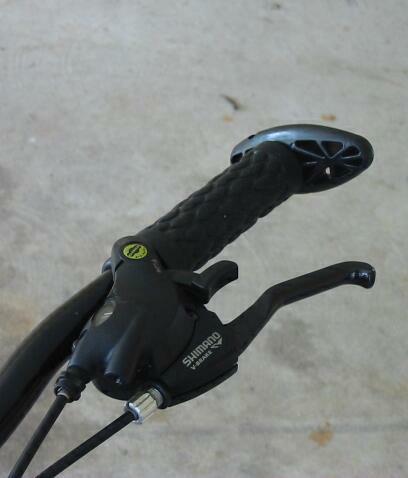 If you have gigantic tektro lever, with lots of slop, it might be worth getting avid fr-5 or shimano deore levers. The shimano levers come with cables and housing, which saves $15. Note that no one slammed the bike or said to scrap it and go to a new frame or bike with discs. OP, "so I am looking to find brakes which can take it all in stride" AND "I want to replace the pads with the best all-weather pads I can find, but am also interested in hearing any suggestions people may have for upgrading the brakes, cables, or levers as well. " So, I don't think that either reply was too far off. I live in Denver and commute year round on a set of Avid SD7 brakes and Avid SD7 levers. I run full length housing and have upgraded to Kool Stop pads. I have black pads during the dry time and red pads over the winter. I was not that impress with the red pads, but it was a dry winter. I prefer SD7 brakes and levers over SD5 brakes and levers. To me, SD7 seems to be not as sloppy and have an over all better feel. Plus it only a slight increase in price. I think you can get a huge performance increase from a quality mid-range cable set and new pads. I have run a Shimano XTR brake cable set, a Jagwire cable set and an Avid cable set and would recommend them all. If cost was not object I would run all XTR, Avid Ultimate or Pauls. Pretty sure his bike has integrated shifter/brake levers. You would need new shifters in order to replace your levers. You have 8 speed shifters, which do not have much selection. I would just replace the brakes and cables. Yes, I do have integrated shifters and brakes. However, I have removed the front derailleur, and am riding a 1x8 setup. Since I don't need the shifter for that any longer, I was planning on replacing that side with a decent brake lever anyways. This happens to be the brake lever for the front brake, so I may replace that single lever for better braking and leave the rear brake and shifter as-is. So far I have heard a lot of good reviews for the SD7 setup and salmon pads. I am still leaning towards sealed cables, as I should have mentioned in the OP, this is my daily commuter bike. I think the benefit of lower maintenance and longer lifespan would be welcome for me. Like I mentioned, I'm out in any kind of weather from rain to snow to ice. Half of my commute takes me through industrial parks, and my current wheels, brakes, and fenders are coated with a wonderful coat of thick black road grime built up over the last year.